Q: Why is the title, Supper, People on the Move? Silvana: One of the first images that started Supper’s narrative and logistics was Da Vinci’s Last Supper along with images of American–Mexican border crossings. The Last Supper has a strong emotional component: all the subjects—even though they are celebrating a ritualistic dinner, Passover—are placed in twisted and bended ways which express an awareness about the turn that their lives is about to take. The first title was Supper alone, because I was thinking of a last meal, a farewell dinner or meal shared with relatives and friends previous to a departure. Then the rest of the title: People on the Move was inspired in Porter Series by artist William Kentridge; one of the sections that I call “balance” is inspired by these paintings that have human silhouettes carved into a map, silhouettes of people travelling—they are on the move, carrying everything they have on their bodies. Q: Can you discuss the movement of Supper? Supper will be mercurial in its performance. The mood fluctuates from constrained to celebratory, from violent to supportive. The goal is to expose noisy departures, bumpy beginnings, bodies exhausted by gravity pulls, contorted balances and extended suspensions in the nether world of being other. Sixteen large tables create a movable set, used to define performance spaces, and to symbolize trucks, platforms, and walls. Paper abounds, highlighting the importance of documents in the lives of immigrants. 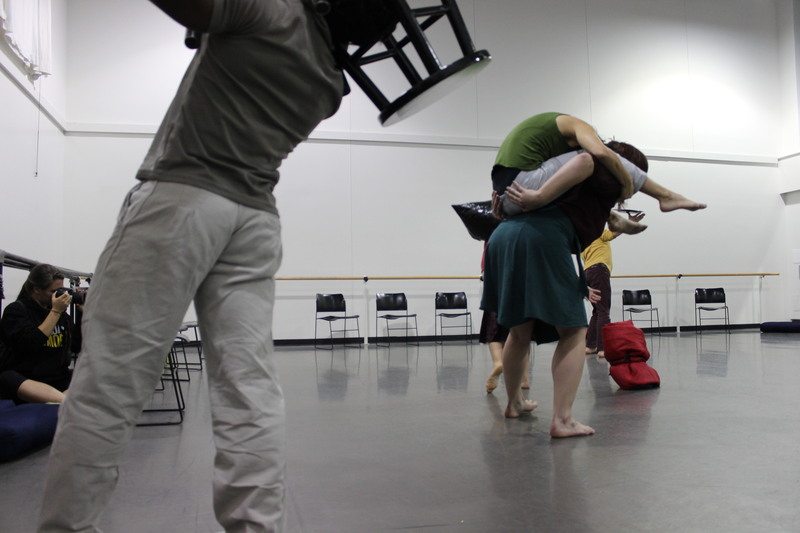 I create dance by using private images and improvisational structures. Performers flesh out the rigorous sketches that I propose. Pure task oriented movement—walking, running, climbing, falling, diving—creates narrative fields of energy that engage viewers in their physicality. Illogical efforts display the body at its greatest vulnerability. Supper will oscillate between immediacy and delicacy. Five dancers block and challenge, climb and dive over one another. At other moments, time slows down while dancers pour strong smelling coffee over small pieces of paper. In other sections I am interested in altering the normal speed and duration of actions, for example creating the illusion of falling at outrageous speeds from a moving truck. Q: Can you describe your jumping off point? Silvana: I live with a decision I made more a decade ago: to move from Buenos Aires to Philadelphia. I have displaced my family and myself. What started as an exciting, temporary move became an experience of endurance and adaptation, an encounter with opportunities as well as with language glitches, gains, and losses. Many visas later, we became American citizens. For some reason during the citizenship evaluation, the officer who interviewed me thought that I had an interesting story; she called me many months after the interview, close to the day of the ceremony, to ask me to talk about my immigration experience. I was asked to speak on behalf of all the immigrants at my citizen ceremony. I was surprised and a bit afraid to speak; all the visas and immigration procedures until that citizenship test have been really annoying and rather than welcome, you feel rejection and suspicion. But I took this invitation to speak to be an honor and an emblematic acceptance. I prepared my speech and I delivered it trying not to cry. It was a strangely emotional moment for me, similar to when I got married, I felt it was a big commitment, and I am very resistant to long term commitments . . . even though I have married twice! The oath ceremony was tense; I could read into the “new” Americans’ bodies and expressions how difficult their journeys and stories have been. There were new immigrants from thirty-four different countries, many of which I had never heard of. When each person was asked to stand up when their country was mentioned, I felt part of the world of people on the move: I was one more in the journey and my history, my story being in my body, mirroring the stories and bodies of millions of people in a world on the move. That day I decided that Supper would be an exploration of migration, and that it would move further away from my own experience. 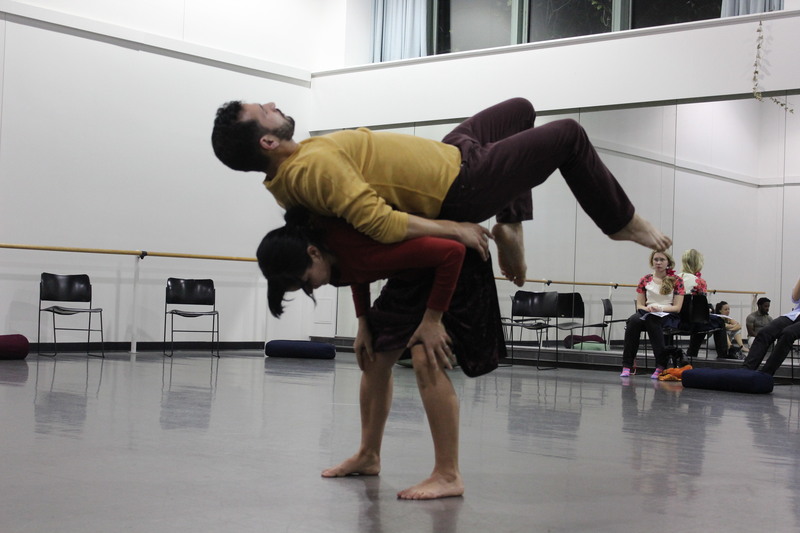 I could address migration through movement, dance. The idea was in the title, Supper, a farewell dinner, a personal history moving into the human experience of people being on the move, the many of us who are looking for new horizons. Q: What is an “in between” place? Silvana: In between places, cultures, languages. Constantly translating thoughts in both languages, dreaming in English, speaking Spanish, thinking in Spanish and speaking English. In between is the overlap, where many people live. Migrants, legal or illegal, are displaced; trespassing borders they become the other. The in betweeness of the immigration experience is to stretch you to understand, to be accepted. In between visas, long waits for permissions to work, to travel, explaining trips, short or long stays—in short, a nerve breaking process where your freedom of choices are constantly being questioned. Meanwhile, if you are a visitor in J or H visas, your legal status is suspected and questioned every time you encounter entrances and exits in the US. In the process of becoming a resident your freedom of choice is constantly challenged and this process takes months and the estimated time that these processes last is hardly ever met and delays complicate your permissions to work and travel. Then there is a relief when you get a green card or permanent resident card, you gain stability and freedom to stay without having to report every year or so, which you have to do for J or H visas. In transit, in between, that is how I felt for years. I have to admit that perhaps that was an interesting practice for me, it taught me to be in the moment. I find that the best response in dance and performance is when you are alert, in the moment, ready to go. For me it has been living in the overlap of culture and places. After a while you became a dual citizen, you are able to navigate comfortably both cultures, there is certain richness about that experience. Q: Why did you immigrate? In 2002, I did not leave Argentina thinking that I would immigrate, I thought that I would get my masters degree [from Temple University] and I would be back in three years. When we moved to Philadelphia, we left behind in Buenos Aires a rich social life with a great family and friends—as well as my dance studio-performing space and our house. My husband Pablo and I had recognized practices in our fields, but there was a financial crisis and a lot of violence; we needed to leave for a while. Philadelphia was for us a second home—I had come to Philadelphia as undergraduate student in 1986 and stayed until I went to back to Buenos Aires in 1991: we knew we would be safe until the crisis in Argentina was over, and that we would all have a great experience learning and living in my second language and culture. However, leaving our home made us feel in a precarious state. Even though we arrived to the US with a university fellowship and work offers, we had financially lost many resources, and relocating the family was hard. Even though I am grateful for all my new friends, my kids’ great education, and the many professional opportunities Pablo and I have had, we paid a big price for them, financially and emotionally. Once more I feel in between being grateful for the cultural immersion and regret for all our losses. In a way we are all living an “in between” places, idiosyncrasies, states of mind, processes. Perhaps the complicated politics of immigration make these life decisions more complicated than they need to be, stressing even further the process of settling down and in some cases compromising your life and freedom. Q: You started from your personal experience of immigration and as you created Supper you moved into the broader and many varied experiences of immigration, teasing out commonalities. How did this process inform the show? Silvana: As an artist, my process is guided by a close examination of impulses to create. Departing from the familiar to the unknown, my work seizes the moment, following the initial impulse, urging to finish what you started. In this process, you keep moving, adapting your body to the new shapes that these impulses have generated. Supper is a return to myself, to the beginning, to my core. Supper starts with my own my departure; I am now ready, after many moves, to live with my decisions. I am examining the impulse to move away—changing culture, language, territory—as a search. At first, it seems as if the search started for practical reasons, yet when you examine the decision on a deeper level, you know the search is more internal, it is in the most essential parts of your being, it brings you to widen your horizons, your boundaries. Supper, People on the Move is about mobility and decisions moving you: an action starts with a clear intention and it is carried away by a tide of impulses. Many times this preliminary impulse is beyond your control, you are moved by others supporting your initial intentions. The work is about transitions, departures, forced entrances, fleeing, avoiding confrontation and following impulses. I started focusing on my personal experience, leaving behind loved ones and places, but inevitably I wanted knowing more about other migration experiences, specially on the American–Mexican border, because it is the closest experience geographically, and because it has a lot of media attention. I visited the border between McAllen, Texas, and Reynosa, Mexico, and it is very intense to experience life where so many people trespass the border illegally. My first thought when I was at the border, was to think back about my experience arriving to US. Even though it was initiated by professional development, the experience was very intense and has been so difficult emotionally and physically for me. My decision to stay legally in the US, had not been easy; I could not even imagine how difficult it has been for the many people who trespass the border illegally. I was thinking specially of the children who get stuck in between the limbo politics of immigration and their new culture that integrates them completely. It must be a very contradictory experience. People risking their lives and freedom to immigrate, why would this be worth it? Risking getting trapped in between politics, in between cultures, a life in limbo. What is the initial motivation? Is this a leap of faith? I am exploring that moment of trespassing, the physical and emotional entanglement that derives of one decision, one shoot, a leap of faith, this is the common experience for me. Q: What makes the relationship between migration and the body so artistically intriguing? Silvana: The human experience of mobility—regardless the reason for this journey—consumes the human body and mind. Mobility is a process; it requires substantial moving in the physical and psychological realm. In many ways we are all migrants or movers, moving away from our exoduses, from our establishments. I n mobility, living in the overlap of cultures, my task is to make a home away from home. Home, in the new destination, is a transient concept and recreating it becomes a lifetime enterprise. Flexibility and mobility are key components of this experience; adapting and moving away from the familiar makes you constantly reexamines choices, time and space collapsing in new places. Home is an endless space where place, family, relationships, and endless memories collide. Right now, my home and country are my body, where many experiences collide. My body as well as my experience as a migrant is in constant change. 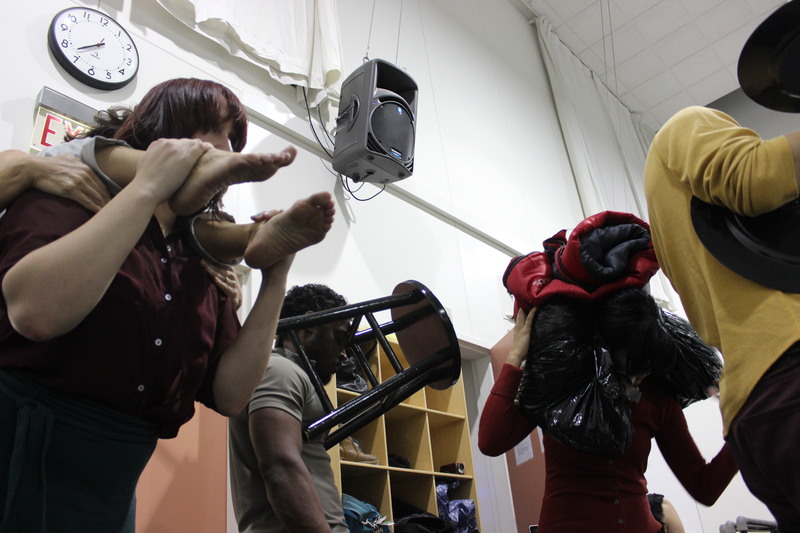 In Supper’s presentation, the performers show clear signals of tension in their bodies. Metaphorically they capture the moment, a snapshot of their mobility/ migration experience, when forces transformed their bodies as they undertake transnational moves. These bodies have defiantly and dangerously crossed frontiers. With this act, they have become the other. In Supper, the body is the new territory, indicating not only the possibility of extreme physical exertion, but also containing and carrying signs of identity, historical contradictions, mental and emotional entanglements. Q: Can you give examples of movements you observed from the immigration experience, what struck you about them, and how you turned them into dance? 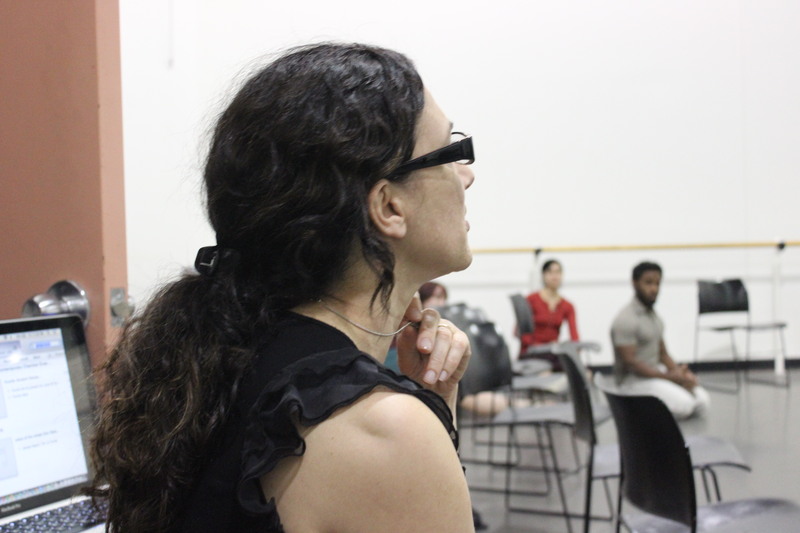 Silvana: The complexity of this work is in creating a dance that contains the current conversation, which is charged with history and politics, while avoiding the marginalization and collapsed portrayals of experiences into a generic visualization. In Supper, the protagonists make their trespassing journey carrying all they have in their bodies, bringing belongings and skills to a new place. They create a procession into the future. Two of the dancers are migrant children, one brought from Cuba and one from Mexico as toddlers. Now, they have remote memories of these experiences. One came in one of the Marielitos boats, the boat sank three times before arriving to Miami; she only remembers falling into the cold waters, holding on to her pacifier and the pitch black night in the ocean. The other crossed the border by coyotes, human smugglers, and was drugged with Benadryl so that he would not wake up and cry; he was just a baby. From their stories we have elements that suggest memories, or parts of culture, like coffee beans, symbolizing the Cuban experience, and papers, alluding to the need or lack of legal documents to reside in this country. Both elements and stories are personal, but mirror many other stories like theirs. Q: How will the audience experience the show? 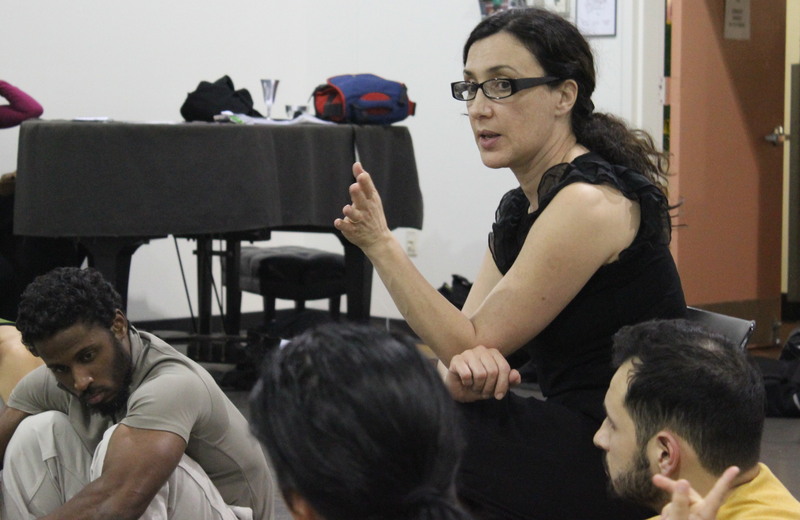 Silvana: Audiences are participants in the performance. The entrance area will reflect the immigration experience: not only we will ask for a ticket, we will ask for state ID perhaps a number of times, we will take pictures, and grant “waivers.” The performance space is an abstract place, where a large table is set and transient bodies are seen in shadows on the walls—a dance of shadows or in the shadows like the trespassing bodies in at the border. The venue, the Ice Box, was chosen because of its barren, inhospitable qualities: a white cube that is a non-destination, in between places, perhaps a desert, perhaps a living room, perhaps a place in the far horizon. It is ideal for surveillance, from any angle you can observe it all. Once the audience and performers enter the space, there is no possibility of fleeing or disguising oneself. Q: Why end with a meal? Silvana: The dance concludes by inviting each audience member sit at a table to participate in a large communal meal, where the performers invite the audience to share a meal, a supper to open up conversations about the state of immigration. We end with a meal to connect, to humanize the experience with a simple act of providing food, is to share culture, to connect people to the pleasurable experience of sharing culture. This is also a reminder of the shared human relationship to flavors and colors and to the deeper connections among us. And it is at tables that politicians meet and discuss changes, and it is at table, dinners, and coffee meetings where people meet to discuss current issues. The meal is an opportunity to discuss what is happening right now, of people’s own arrivals, departures, and personal experiences of immigration. November 2014. 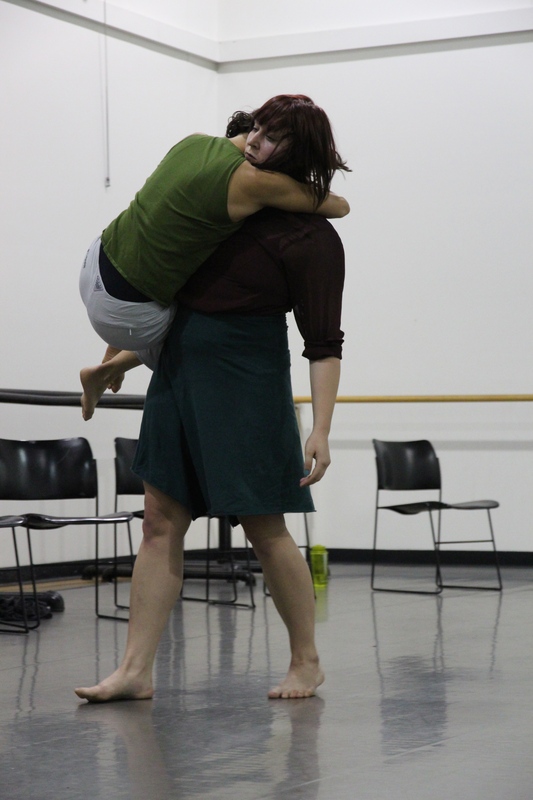 Photos by Said Johnson and Jennifer Baker (2nd and 5th photo) from an open rehearsal at Swarthmore College, October, 2014.